Chairman an Foonder Vulcan Inc.
Paul Gardner Allen (21 Januar 1953 – 15 October 2018) wis an American business magnate, investor an philanthropist. He is best kent as the co-foonder o Microsoft, alangside Bill Gates. As o August 2016, he wis estimatit tae be the 40t richest person in the warld, wi an estimated net worth o $18.6 billion. 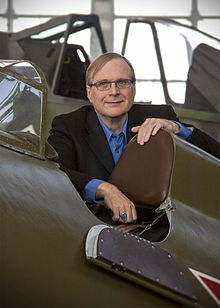 ↑ "Paul Allen". Forbes. Retrieved 2015-07-31. ↑ "Paul Allen". Retrieved 2016-08-12. This page wis last eeditit on 16 October 2018, at 09:27.